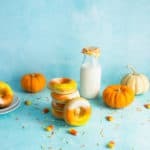 These candy corn doughnuts are every bit as easy as they are pretty. If you’re looking for a last minute Halloween treat, this is it! Bake (or buy) your doughnuts and make sure they’ve cooled to room temperature (if you baked them). In a medium-size bowl, beat the powdered sugar and milk until thick. Make sure there aren’t any powdered sugar lumps. Separate your icing into three bowls. Tint one orange, one yellow, and leave the third one white. Spoon a couple of tablespoons of each color onto a plate or shallow bowl. Make sure the colors are close enough to touch. Dip the top of each doughnut into the icing, making sure you don’t push it so far down that it touches the plate (this will make the icing patchy wherever the doughnut touched the plate). Allow the excess icing to drip off before turning the doughnut right side up. Add another tablespoon of each icing to the plate and repeat. Make sure to refresh the icing between each couple of dips. Allow the icing to harden completely (about 20-30 minutes) before packaging. Consistency is key with this glaze; you want it nice and think but not so thick that it won’t stick to the tops of your doughnuts. You know you’ve reached the right consistency when you can drop a spoonful of glaze back into the bowl and it reabsorbs in about 10 seconds. Be sure to add more glaze to your plate/bowl every couple of dips so that the glaze stays fresh and doesn’t crust. This is a relatively soft glaze so make sure you don’t pack or stack your doughnuts until the glaze has completely hardened. Leftovers: The glaze on these doughnuts is relatively soft and does not keep well. In all likelihood, leftover doughnuts will develop marks and divots in the glaze if stored overnight. If you end up with leftovers, the best way to store them is in a paper bag. Whatever you do, don’t refrigerate them or put them in plastic.